Young Artist Award for October 2003. Maxilmilien, a graduate of Daniel Hand High School, has studied classical trumpet with Richard Green of the Eastern Brass Quintet. For each of his four years in high school, Maxilmilien was a member of the Connecticut All State Bands, and for three years he performed with the Jazz Ensemble. In addition to being a member of his school's marching, symphonic, and stage bands, he also performed with their orchestra. Max was the recipient of the Connecticut Association of Schools Arts Award in 2002, as well as the John Phillip Sousa Band Award and the National School Orchestra Award. Seeking additional jazz performance venues, Max was a member of Connecticut Youth Jazz. In this group (under the direction of Reid Gerritt) Maxilmilien had the opportunity to perform at the Essentially Ellington Jazz at Lincoln Center High School Jazz Band Competition & Festival in 2002, winning the Outstanding Trumpet Soloist Award. Maxilimilien has pursued his love of jazz attending summer jazz camps at the Manhattan School of Music, Conservatorium van Amsterdam in the Netherlands, Purchase College, the Eastman School of Music, and William Patterson University. Max currently is enrolled as a jazz performance major at the Manhattan School of Music where he studies with Lewis Soloff. In recognition of his outstanding talents, ITG will provide Mr. Darché with a complimentary one-year membership. ITG is proud to announce that Carlos Alberto Sanchez of Oklahoma City, Oklahoma, has been awarded the June 2003 Young Artist Award. Nominated by James L. Klages, professor of trumpet at University of Central Oklahoma, Carlos began his trumpet studies at age seven and moved to Oklahoma from Venezuela at age eleven. Currently thirteen years old, Carlos has played principal trumpet with the Oklahoma Youth Symphony. He is currently a member of the jazz band, concert band, and trumpet choir at University of Central Oklahoma. Professor Klages says, "Carlos is as talented as any student I have worked with. A mature and serious student of the trumpet, he has learned a new solo and etude almost every week since I started working with him. I believe we will hear more from him." 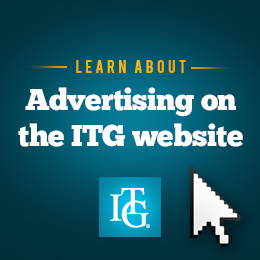 In recognition of his outstanding talents, ITG will provide Mr. Sanchez with a complimentary one-year membership. Jeff Ostroski has studied classical trumpet with Richard Green of the Eastern Brass Quintet. In high school, Jeff performed with the Connecticut All State Jazz Ensemble and Concert Band, as well as the Greater New Haven Symphonic Youth Orchestra. In addition to winning the Outstanding Achievement in Instrumental Music Award at Guilford High School, he received the Berklee College of Music Judge's Choice Award and Outstanding Musicianship Award for both big band and combo work. Equally proficient in classical and jazz, Ostroski has attended jazz camps at the Eastman School of Music and William Patterson University. Ostroski currently attends Lawrence University/Conservatory of Music where he studies with John Daniel. In recognition of his outstanding talents, ITG will provide Ostroski with a complimentary one-year membership. Nominations for the Young Artist Award are accepted throughout the year. ITG is proud to announce that Christopher Konfirst has been awarded the October 2002 ITG Young Artist Award. Christopher began trumpet studies with Bob Guenzler, retired high school music director, and throughout high school, he studied with Michael Stewart, music director of the Chicago Brass Choir. During high school, Christopher participated in many different competitions and groups such as Illinois All-State Honors Orchestra and Honors Jazz Band. In addition, he served as principal trumpet in the Chicago Youth Symphony Orchestra and Metropolitan Youth Symphony Orchestra. Besides soloing with the Lockport Wind Symphony, Christopher received many awards, including the Louis Armstrong Award and the Woody Herman Award. He currently attends the Curtis Institute of Music where he studies with David Bilger, principal trumpet of the Philadelphia Orchestra. In recognition of Konfirst's outstanding talents, ITG will provide him with a complimentary one-year membership.